IMPORTANT: It is critical to identify the species and habits of destructive termites in order to formulate an appropriate control program. The species that cause severe structural timber damage to homes in northern California are (1) Western subterranean termites (2) Western drywood termites, and (3) Pacific dampwood termites. CONTENTS: updated - the destructive termite species in nothern California; where they are found; their destructive nature and capabilities; the life cycle of each species; the fascinating life of a queen termite, king, armoured soldiers and the colony's tireless worker termites that do all the damage; identification tips and consumer protection advice on how to protect your home from a termite infestation. They cause severe economic loss to homeowners in northern California, particularly in and around the San Francisco Bay Area, Santa Rosa, Sacramento, Fresno and Monterey regions. The Western subterranean termite is a serious economic timber pest causing millions of dollars of damage throughout northern California. It is estimated that more than 1 in 5 homes in the urban areas of most northern California cities have been or will be attacked at sometime by these voracious little insects. AREAS of HIGHER RISK in NORTHERN CALIFORNIA include Alameda, Antioch, Berkeley, Carlsbad, Chico, Chino, Citrus Heights, Clovis, Concord, Cupertino, Daly, Danville, Davis, Elk Grove, Fairfield, Folsom, Fremont, Fresno, Gilroy, Hayward, Lake Forest, Livermore, Lodi, Madera, Manteca, Merced, Milpitas, Modesto, Mountain View, Napa, Newark, Novato, Oakland, Palo Alto, Petaluma, Pittsburg, Pleasanton, Redding, Redwood City, Richmond, Rocklin, Rohnert Park, Roseville, Sacramento, San Francisco, San Jose, San Leandro, San Mateo, San Rafael, San Ramon, Santa Clara, Santa Cruz, Santa Rosa, South San Francisco, Stockton, Sunnyvale, Tracy, Turlock, Union, Vacaville, Vallejo, Walnut Creek, Watsonville, Woodland, Yua and surrounding areas. Western subterranean termites are highly destructive to douglas fir and other common building timbers widely used in the construction of homes in northern California. In large numbers, the subterranean worker termite will rapidly devour the internal spring wood sections; preferring to leave the harder summer wood sections. As`a result, infested timbers are often left as a thin external shell, with layered "honey-comb" hollow sections (as illustrated) packed with moist soil. Western subterranean termites thrive in a moist dark environment. Moisture and humidity control are essential for their survival. Western subterranean termites are a secretive, yet highly social insect. They develop huge underground nests, containing a queen, king, winged reproductives (young kings and queens) or "alates", soldiers and workers. 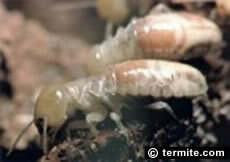 Identification: Western subterranean worker termites are small in size, about half the size of match-head or 1/8" long. They are a creamy translucent colour, soft bodied, have no wings, are sterile, blind and work 24 hours a day for their entire adult life-span. Identification: the soldier termite has an orange coloured, rectangular armoured head, with mandibulate pinchers which they use to crush the ants. On their forehead is a fontanelle (frontal gland hole) used to squirt a sticky latex to ensnare the ants. The soldier's mandible pincers are curved at about 70 to 90 degrees. The body of the Western subterranean termite is flat, with the width of approx 1/32”. Consumer Note: If you open termite infested timbers or their mud tunnels or shelter tubes, it is the soldier termites that rush out to guard the area whilst the workers repair the breach. The identification of these insects as "termites" means an immediate professional inspection and protective measures are essential to avoid further ongoing or extensive damage. Remember: the standard home insurance policy in northern California, does NOT cover the costs of repairs or replacement of termite infested timbers in a home. Swarmers or the reproductive termites - scientifically called "alates" are commonly seen by homeowners in northern California, when they swarm in large numbers, generally in the spring, during daylight. They have eyes, are poor fliers but can be swept hundreds of yards, by the wind. When they land, they drop their wings, find a mate to become king and queen of a new termite colony. Identification: Western subteranean termite "swarmers" are about 3/8" in length, including wings. They have a dark brown body and a small fontanelle (frontal opening) on it's head. Their wings are a brownish grey, with two dark solid veins along the forefront of the front wings, which are distinctly larger than hind wings. The termite colony may contain more than a million termites foraging over a 12,000 square feet range, and actively feeding on trees, buildings and other timber structures. Colony nest development is slow in the first few months, with the egg-laying capacity of the queen termite peaking after a few years, producing up to 10,000 offspring a year. The queen may live for many years and workers up to two years. The picture left, shows a termite inspector examining an above ground termite subsidiary nest built inside a wall cavity of a home. 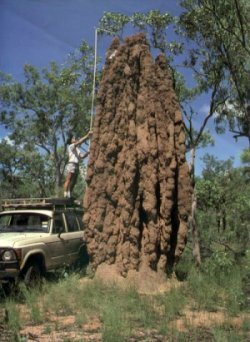 This is an above-ground termite nest in tropical Australia. 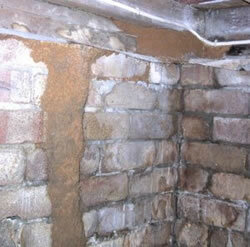 In the USA, the destructive subterranean termite species build their nest completely below ground level. A large Western subterranean colony northern California is most often unseen, until a serious problem is encountered. Modern subterranean termite control methods include termite baiting systems; installation of a treated soil zone around the base of a building; and a range of maintenance measures to make the building less susceptible to infestation. Where do You find them ? Native to the US, the Western drywood termites are found accross the southwestern states, and as far north as Sacramento, with a heavier incidence along the coastal areas. Drywood termites are considered non-subterranean termites, as they do not live in the ground, require no ground contact, and do not build mud shelter tubes. Can you bring them into the home in furniture ? YES - Western drywood termites can be transported in infested timber furniture or even picture frames. This termite can survive inside timber with a low moisture content and can branch off to form multiple independent colonies, each containing up to 3,000 termites. They are known to cause extensive damage in buildings. Are all types of buildings prone ? Western drywood termites more likely to be in a structure made completely of wood with poor workmanship demonstrated by poorly fitted corner joints. The termites typically inter the ends of wood and seldom enter the sides of the section in question. After the mating flight, they seek cracks or knotholes in nearby wood and chew a small tunnel which they close then excavating a chamber after which they mate. Identification: Swarmers are about 1/2'' long including wings, which are approx 3/8" long. The head and pronotum of the swarmer is an orange brown and its abdomen is dark brown - see picture on left. Key identifier: The front wing has 3 dark, heavily hardened veins in the front portion. When the colony is about four years old it will, when the time is right, emit hundreds of reproductive swarmers from the nest. It is amazing how all the mature Wester drywood termite colony nests across an entire region, will swarm several times a year, but all at the same time. This is essential to produce new nests, to continue their 250 million year evolution. Swarming typically takes place about mid-day on sunny, warm (80°F) days, with the peak of the swarm occurring shortly after a sudden rise in temperature. The swarming season usually occurs during September and October. Swarmers usually number in the dozens, occasionally the hundreds. Night swarmers are attracted to lights. Identification: Soldiers, the forehead of which slopes down gradually from top of head. The head is flattened to slightly rounded in side view. The head is orange to reddish brown with the eye spot whitish - see picture on the left. Soldiers have mandibles with unequal number of teeth on each member of pair, and antenna with the third segment greatly enlarged and club-like - as indicated by the red arrow in the picture to the left. The soldiers are the defenders against intruders so if you open up timbers containing a drywood infestation it is the soldiers that first rush out to guard and defend the other colony members. Although the colony development is slow, severe structural damage may still be caused by the presence of multiple-colonies. Their gallery and tunnel walls are velvety smooth, and no soil is present, unlike subterranean termites. Another key identifier is that there is no workers present in Western drywood termite infestations; it is the nymphs perform all tasks typically done by workers. Identification: Timber Damage: Drywood termites eat across the wood grain and create chambers, or galleries connected by tunnels. Although the colony development is slow, severe structural damage may still be caused by the presence of multiple-colonies. Their gallery and tunnel walls are velvety smooth, and no soil is present, unlike subterranean termites. A distinctive indication is no presence of a worker caste and the nymphs perform all tasks typically done by workers. Identification: Faecal pellets are found throughout their tunnels. Generally, there are faeal pellets present. They are hard, less than 1/32'' long, elongate-oval with rounded ends. One of the unusual distinctive signs of their faecal pellets is that they have 6 concave sides. Termite Control: Western drywood termites - firstly, obtain a professional termite inspection to determine the extent of an infestation and locations of other possible drywood termite colonies. The results of the inspection will dictate the best treatment options as no single control method is best for all situations. Where the infestation is severe and extensive - the entire building may need to be fumigated wtth sulfuryl fluoride (Vikane.). Fumigation is a highly technical procedure which involves surrounding the structure with a gas-tight tarpaulin, releasing the gas inside the seal, and aerating the fumigant after a set exposure time. Before fumigation, the homeowner must remove all plants and animals from the house, remove or place food items inside special protective bags, and insure that there is sufficient tarp clearance between sensitive landscaping and exterior walls. Where the infestation is only loacalised - it may sufficient to effect localise spot tretments of the termute colony. An insecticide is injected into small holes drilled in the timber and into termite galleries. This is the simplest and most direct method of treatment. The amount of drilling required and the effectiveness of this treatment depends on the chemical used and the nature of the infestation. Where do You find them ? The Pacific dampwood termite is the largest and most significant dampwood termite in the United States. They have been found up to 6,000 feet above sea level, but more commonly in the cool and humid coastal areas of northern california. Where do they build their nests ? Pacific dampwood termites build nests of up to 4,000 in a colony in damp timber. Direct contact with the soil not necessary when if the timber has a high moisture content. pacific dampwood termites are a common problem found in beach homes, in cool, humid regions. The Nevada dampwood termite occurs in the higher, drier mountainous areas of the Sierra where it evident in mountain cabins and other forest structures; it also occurs occasionally along the northern California coast. How destructive are they ? Pacific dampwood termites will attack most species of timber in buildings throughout its range. Timbers in contact with the soil or structures built near or over water are common targets. Pacific dampwood termites are highly tolerant of moist conditions - sometimes found infesting piers to tidal flooding. A well established colony will produce winged reproductives "swarmers" which may infest nearby timber. Identification: Swarmers may be seen throughout the year, but most often from August through October. Swarming usually will occur on warm humid evenings just before sunset and are attracted to light. Swarmers are up to 1" in length and of a light to medium brown color with dark brown wings. Nevada dampwood termites are slightly smaller and darker than the Pacific species; reproductives are about 3/4 inch long. Identification: Soldiers have a large head armed with long black toothed mandibles. The anterior portion is black generally shading to a dark reddish-brown in the posterior position. The abdomen and thorax are a light caramel color, the abdomen varying according to the stomach contents at the time. The largest termites in the United States, soldiers may be very large, reaching 5/8 to 3/4". Identification: Workers / Nympths are cream-colored with a characteristic spotted abdominal pattern caused by food in their intestines. Identification: Timber Damage caused by Pacific dampwood termites varies greatly in size and shape and in sound timber may be concentrated upon the softer springwood. Identification: Faecal pellets are found throughout their tunnels. The pellets are of a similar color as the timber consumed, hard, oval shaped, like a rice grain and about 1/25" long. By contrast, the pellets of the highly destructive drywood termite has a distinct longitudinal ridge - like a pumkin seed in shape. If in doubt contact the experts. 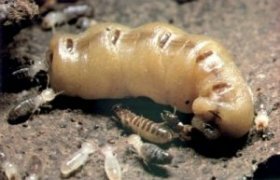 Termite Control: If the infestation is small, destroy accessible nests by removing infested wood. Where practicable, removing excess moisture from the timber will also destroy dampwood termite nests. If colonies are numerous or inaccessible, contact a professional pest controller to carry out a detailed inspection using specialised equipment and provide an estimate and specifications in writing for a termite control program.